UK firm Premier Foods has agreed to buy Marlow Foods, owner of meat substitute Quorn, in a £172m ($312.6m) deal. The purchase was made from Montagu Private Equity and should be completed on Monday. In the year to 31 December sales of Quorn, which comes in a variety of products such as burgers and sausages, were £79m - 100% of Marlow's sales. Robert Schofield, chief executive of Branston Pickle-maker Premier Foods, said it was "a fantastic acquisition." Quorn was launched with vegetarians as its main target group, but it now covers the whole health food sector. It has increased sales by 7% a year, on average, in the past five years. "Quorn's strong brand recognition and leading category positions immediately provide Premier with a very strong branded position in an exciting growth market," Mr Schofield said. "Quorn is ideally placed to benefit from the increasing demand for healthy eating and the combination with Premier should accelerate its growth." 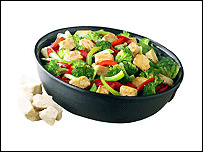 As well as grills, Quorn is also sold in fillets, in slices, as chunks or mince, and in ready-meal forms. The UK accounts for three-quarters of Quorn sales, with another 21% of sales exported to Sweden, Switzerland, Belgium and Holland. Quorn has a 60% share of the UK's £155m "meat-alternative" market, and a 15% share of the broader £640m meat-free market. North Yorkshire-based Marlow Foods will be run by its existing management team and as a stand-alone unit by Premier. Premier added that the deal would enhance earnings and suited its strategy of acquiring "UK focussed" brands. The buy is expected to generate purchasing and administration synergies of £4m a year by 2008. As well as Branston pickle, Premier also owns a range of well-known UK brands including Typhoo tea and Bird's custard.